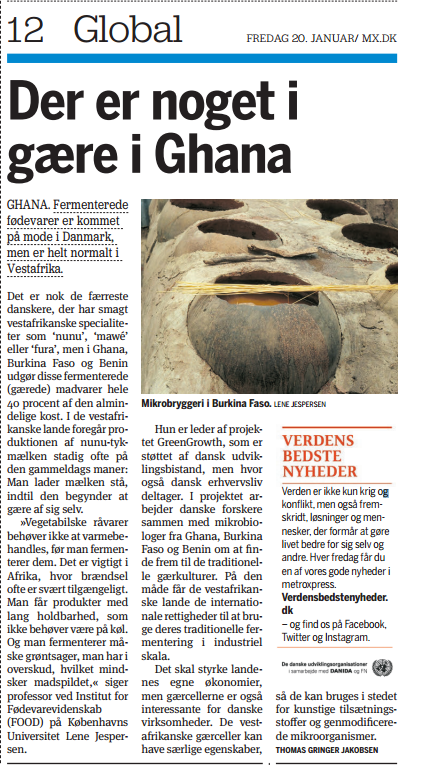 Green Growth article in Metroxpress (January 20th 2017, in danish), with Lene Jesperson from Copenhagen University. Five academic research posters were presented at the 2015 Copenhagen Microbiology Center Symposium and the 2016 International ICFMH-Conference - FoodMicro. Please click the links below to view and download the research posters. My journey from the CSIR-Food Research Institute in Ghana to the Danish Technological Institute (DTI) was the outcome of the meeting of the project "Preserving African Food Microorganism for Green Growth" held in Accra in May 2016. This was aimed to enable me to acquire practical knowledge in developing and supporting the generation of business models for all the reengineered products under the project, namely,Fura and Nunu from Ghana, Mawé from Benin and Lait Caillé from Burkina Faso in order to ensure sustainable commercialization of the products. 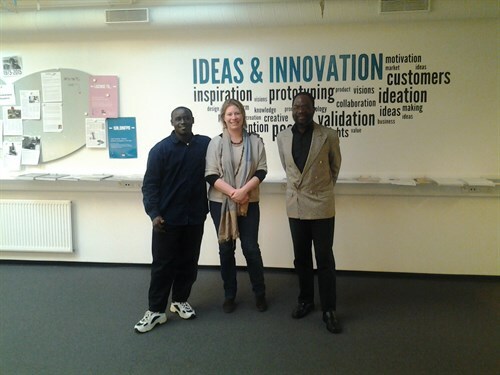 On arrival in Denmark on 10 October 2016, I was met at Copenhagen Airport by Ana Maria d'Auchamp and checked into the DANIDA FELLOWSHIP CENTER (DFC) in Fredriksberg. At the Danish Technological Institute (DTI), I was attached to the Centre for Ideas and Innovation where Ana and most colleagues dealing with business development are located. I also visited the DTI International Centre where Moses Mengu introduced me to Institute and the philosophy upon which the organisation was founded over 115 years ago. The Institute's focal point since the beginning has been on "innovation" and how science and technological knowledge can be translated into practical solutions to assist small and medium-sized enterprises. This is a model worthy of emulation by many of our Institutes in Africa. The most interesting subject of my study so far, is learning to differentiate between "invention" and "innovation", a subject that has intrigued me for many years. Another lesson I have picked up from my discussions with colleagues at the Centre for Ideas and Innovation is the importance of understanding the use of business models in order to ensure the success of our efforts to commercialise our developed products in order to guarantee sustainability. After, my visit here, I hope to have gained sufficient knowledge that I can share with other Green Growth partners from UDS (Ghana), UAC (Benin) and DTA (Burkina Faso). I also hope that we can together come up with ideas to support the commercialization effort for all selected green growth project reengineered products. I wish to thank Danida for funding this collaboration and also to thank all project partners, especially, Professor, Lene Jespersen, Moses Mengu, Dr. Amoa Awuah, Ana Maria d'Auchamp, Pernille Johansen and Eva Thaulow at DFC who arranged my travel. The second consortium meeting with all the partners was held in Copenhagen. Representatives from all the project partners were present and productive discussions were held about the progress of the project and future plans for the four PhD projects initiated in the project. The partner Chr. Hansen also held an exciting presentation about their work. More news to be updated soon. The coordinator for DANIDA sponsored 'GreenGrowth' project at the University for Development Studies (UDS), Ghana, Dr. James Owusu-Kwarteng, has given a presentation at a one day thematic seminar on value chain research which was held on 28th October 2014 at COSTECH, Dar es Salaam, Tanzania. The Tanzanian Commission for Science and Technology (COSTECH) in collaboration with the DANIDA Fellowship Centre organized the seminar to bring together researchers, politicians, civil servants, development practitioners and other relevant stakeholders to take stock of "where we are" on value chain research, and to discuss relevant issues concerning the research frontier, policy interventions, and other burning issues related to the research agenda. The meeting also included a focus on how to facilitate networking and promote communication of research results to stakeholders/policy makers and development practitioners. Presenters and discussants were invited from Tanzania, Ghana, Nepal, UK, Kenya and Denmark, representing a broad and international selection of value chain researchers. Under the auspices of the GreenGrowth project ("Preserving African Food Microorganisms for Green Growth") and with partial sponsorship from the Otto Bruuns Fond (Denmark), Sofia Araujo undertook a two-month field visit in Ghana during October and November 2014. See more information here. The SCIENCE Development Working Group (in Danish SCIENCE Uland) of the Faculty of Science at Copenhagen university is organizing an event on 13th November 2014 in order to facilitate new partnerships and cooperation between researchers at SCIENCE and private companies in Denmark that have a common interest in developing countries. The three topics identified are food, water and agribusiness value chains. Join us! Download invitation (in Danish) here. The Kick-off meeting for the project will be held in Accra, Ghana the 21-23rd May 2014. It will be the first time all project partners and PhDs will be meeting to present each other's organisations, work packages and plans for the project. More news about the exciting event will be updated shortly. As part of the collaboration between Chr. 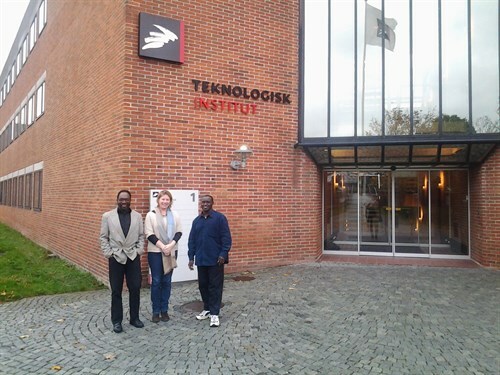 Hansen, the University of Copenhagen (lead institution with Professor Lene Jespersen as coordinator), the Danish Technological Institute and four African universities and institutes, Chr. Hansen will host a new African PhD student in the GreenGrowth project, which is supported by Danida under the Ministry of Foreign Affairs of Denmark. For more infomation on the participation of Chr. Hansen click here.